Time flies! Holiday season is around the corner. 1) Passport pick up this week, 12 noon, in the office. 2) Room parents meeting right after Thanksgiving, on December 4th. Two sessions: 9:45 - 10:45 am, 1:45 - 2:45 pm. Agenda: 2017 Chinese New Year Festival. Parents, come and join us. We need your input to make the event most enjoyable! 3) No school on November 27. 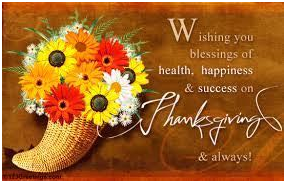 Enjoy your Thanksgiving day! For high school seniors, good luck with your application to colleges! 5) More scholarship for high school ! See attachment. 6) Only 4 weeks left before our Chinese New Year Festival (January 15th) ! Dragon Team 舞龙队 and Drum Team 腰鼓队are recruiting! It's fun and unique. No experience needed. Join us and have fun! I shall see you all on December 4th.